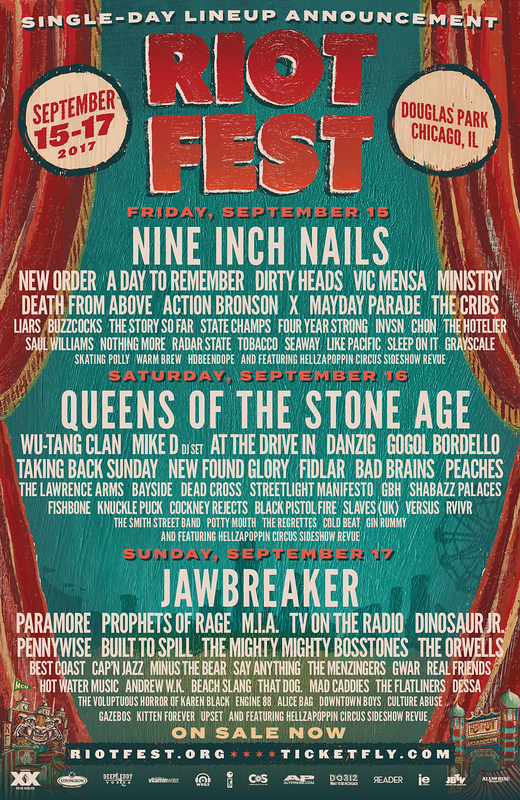 The 2017 edition of Riot Fest happens September 15 – 17 in Chicago and they’ve just released the daily lineups. Saturday (9/16) is headlined by Queens of the Stone Age, and also features a just-added Danzig, plus Wu-Tang Clan, At the Drive In, Gogol Bordello, Taking Back Sunday, Fishbone (performing Truth & Soul) and more. Sunday (9/17) is headlined by Jawbreaker, with Paramore, Prophets of Rage, MIA, TV on the Radio, Dinosaur Jr (performing You’re Living All Over Me), Built to Spill (performing Keep it Like a Secret) and more. Single day and two-day tickets for Riot Fest 2017 go on sale Friday, June 23 Central Time. Check out the full daily lineups below. Ten bands are playing full albums at the fest. Eight have been announced and the remaining two will be announced tomorrow. Stay tuned.